Sorry for my lack of posts last week. For those of you who don’t know, my father had passed away last weekend. We are all doing fine and I am just glad the man was able to get his life back on track before leaving us. He was an amazing man and will be missed deeply. Moving forward I am not slacking it this week bringing you a review of a cigar that I couldn’t wait to get my hands on. La Barba. We founded La Barba Boutique Cigars in 2010 after many different ideas, cigars and a few too many bourbons. We wanted to present a product to the marketplace that was not only fun but also focused on the craft of blending and making of something that we are both very passionate about… cigars. After tossing around a lot of ideas, we decided to name the brand La Barba, which is Spanish for “the beard”. We agreed that we needed something that expressed us, as well as everyone around us. Individuality and the concept of expressing yourself is something that we strongly believe in. And we hope you see that in our cigars. La Barba embodies the idea of the individual, focusing on the idea that everyone is different, their palates included. We will offer a dynamic array of small batch, limited edition products as well as a core group of static products. Focusing solely on quality and small production. La Barba keeps the nostalgic, vintage feel and utilizes social media and viral advertising as well as personal interaction as marketing tools. We believe in the artisanship of the craft of premium cigars and the culture and brotherhood it represents. Our passion is what drives us to succeed and we will operate this company on the basis of slow, steady profitable growth. We want to present a unique and unprecedented product as a lifestyle brand. We will focus on being approachable, comfortable, and fun. Family, friends, food, wine, beer and cigars are what we love. It is what we know and what we do best; this company is founded on our love and passion for those interests. While some people may coin the concept as a gimmick or even mildly cheesy, I like it. They state above they are best friends, doing something fun. And to be honest, without giving too much away, I think the product speaks for itself. 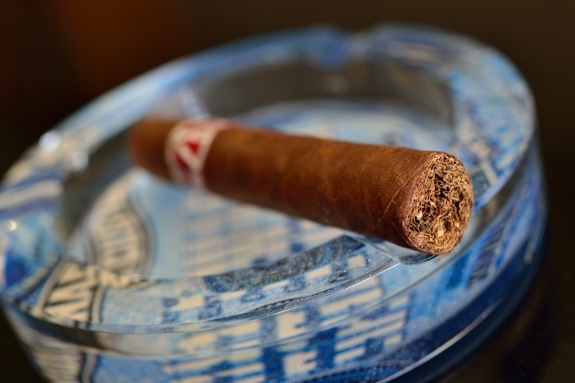 The cigar is composed of Ligero Corojo fillers, Habano Criollo Binder, wrapped in a Corojo wrapper. La Barba is trying to keep their sizes within classic Cuban Styles. They offer La Barba in five formats: Petite Lancero (6 x 38), Corona (5 ¾ x 46). Petite Robusto (4 ½ x 50), Box Pressed Robusto (5 x 50), and Box Pressed Toro (6 x 52). The samples I was given by Tony are actually non-box pressed robustos. These may have just been made for sample purposes only. Many of the boutique brands and companies carry very high price tags since they have to offset more of their costs, but working with Christian the La Barba is able to come in slightly cheaper than I expected with a price tag between $8 – $12 depending on format. La Barba is aiming for a September release. Prelight: La Barba starts out with this awesome, rustic looking wrapper. The wrapper is a dark to medium brown but carries lots of natural splotches in the leaf of a darker and much lighter brown. 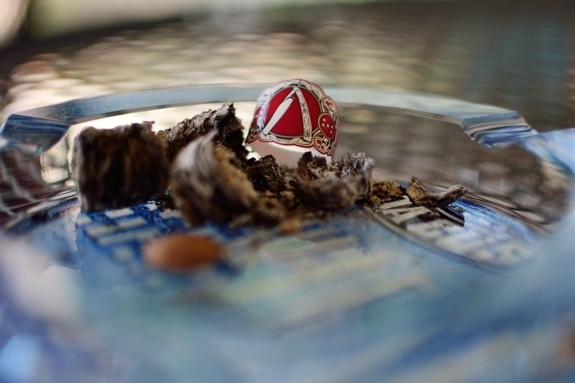 Again, I love it when tobacco really showcases how natural it is and this wrapper does just that. The wrapper is very toothy with some light oils. The construction is a close to flawless as you can get. 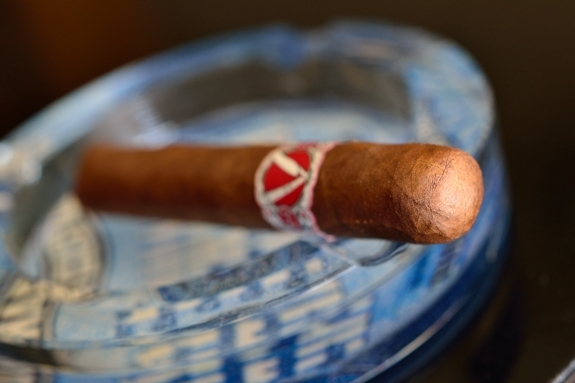 Each fold is seamless and there are only one or two small, visible veins throughout the body of the cigar. La Barba is capped off with a beautifully round double cap. 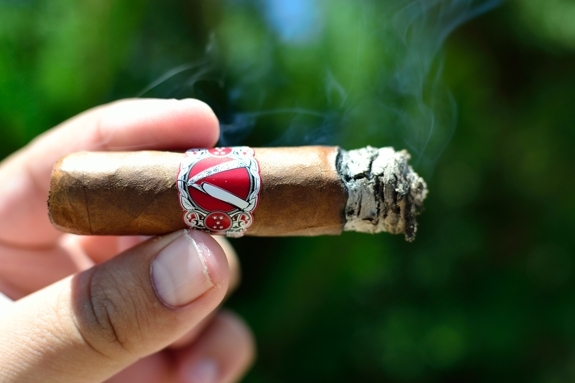 The band on the cigar, which I love, has a beautiful hand drawn, black and white crest with an old-time straight razor on the front and the words “La Barba” in the black laid in red ink. 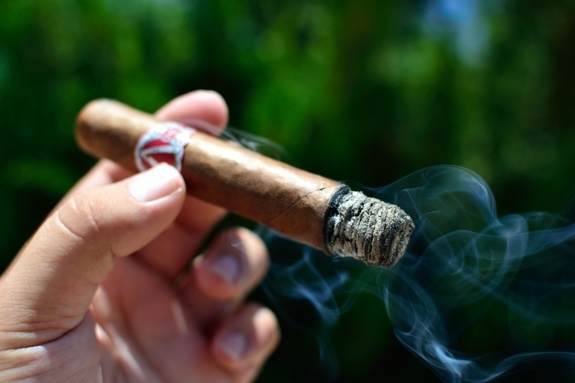 The cigar is very firm and sports no soft spots at all. The wrapper screams of natural tobacco, sweet cedar, with just a pinch of spice while the foot of the cigar kicks out just a ton of sweet tobacco aromas. The cap cut very clean and easy using my Palio double bladed cutter. The cold draw produces a really strong, natural tobacco flavor with just a touch of spice and pepper. First Smoke: La Barba starts out with a whole ton of pepper and spice right off the bat. You can definitely taste the high amount of ligero in this bad boy. After the pepper began to fade a bit the cigar revealed some sweet cedar, natural tobacco, and a really earthy/grainy profile. 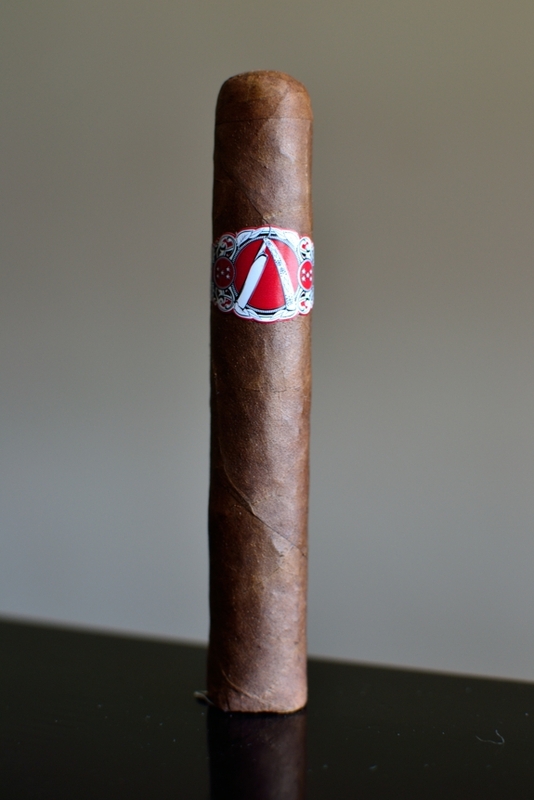 The draw on this cigar is spot-on pumping out a ton of thick, white smoke with every little puff. The burnline is razor sharp and dead even right from the start leaving behind a very compact, dark and medium grey ash which held on for an inch and a half before falling into my ashtray. Halfway There: The second third of this La Barba is very similar to the first. The pepper has let up quite a bit to make room for strong spice flavors while the sweet cedar, natural tobacco, and earthiness is still rockin’ hard. One word comes to mind with every puff, creamy. Although the flavors are pretty strong they blend in so well with one another. The retrohale is very sharp with insane amounts of pepper and spice and I won’t find myself retrohaling this cigar very often. The burnline is still sharp, but a few small waves have began to form. Given how much ligero I am assuming is in this blend I am surprised that it’s burning as well as it is. I am not feeling any substantial amount of nicotine as I close out on the second third. Finish: La Barba has continuously smoothed out over the course of the experience. Crazy though, the pepper has remained in the mix the entire time. While it’s not as strong, its still noticeable and pairs up well with the strong spice. There was a bit of nuttiness as I ventured into the final third as well as the same sweet cedar, natural tobacco, and earthiness that have been along for the entire ride. The cigar took about an hour and a half to take down and remained incredibly smooth and creamy the entire experience, even into the final inch. The burnline is still sharp, and still has a few minor waves, but I never had to touch up or relight the cigar. I am feeling a slight nicotine kick, but nothing too crazy as I put this guy to rest. Overview: This cigar reminded me a lot of something that I would expect from an Illusione line. Which is great, cause I love me some Illusione so that’s a big compliment. In saying that, La Barba wasn’t an overly complex cigar full of change ups and crazy flavors. In fact, La Barba was the opposite. The cigar was very solid, very consistent and very bold. The flavors held true the entire length of the cigar and rarely fizzled out. While the cigar carried a substantial amount of strength, I never once thought it overpowered the experience thus making it perfect for the novice smoker looking for a premium boutique cigar. 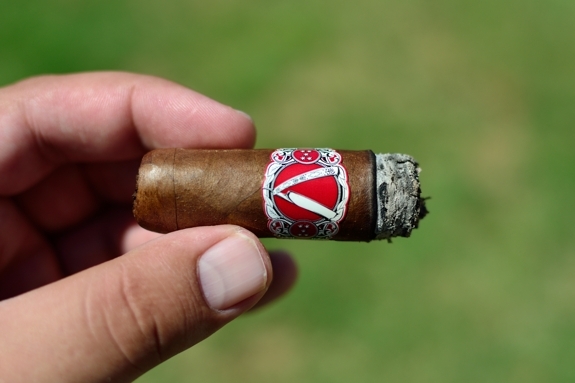 The balance, creaminess, and just overall great flavors are enough that any seasoned cigar smoker will appreciate. I’d be lying if I said I wasn’t excited to see what else Wynwood has up their sleeves. To Sum it Up: While the cigar may seem a bit pricey, it’s actually right on par with what you can expect from boutique blends nowadays. I think that the experience, flavor, and construction all justify the price point and I can totally see these falling into my rotation on the regular. While a box may be pricey for some, I would still suggest picking one up, and if you can’t then at least get your hands on a five pack as this is something you will want to smoke again. I would imagine Havana House will be the first to start selling them. 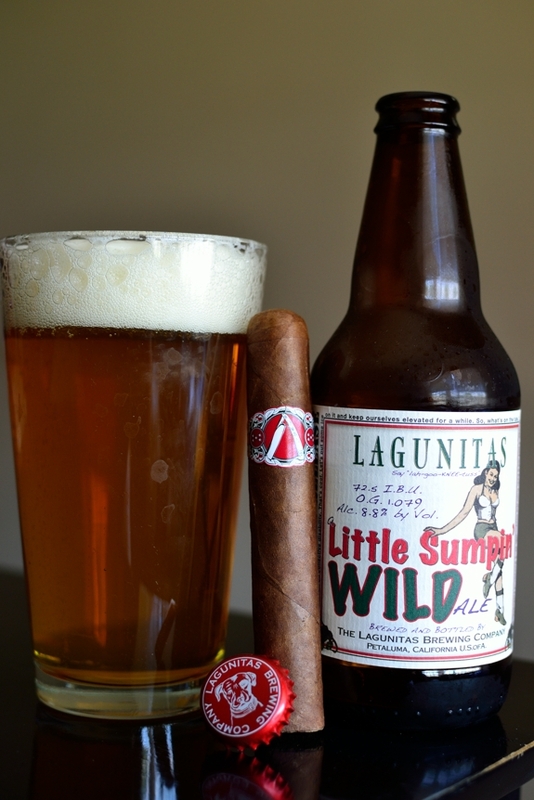 Pairing: We all have heard of, and possibly sipped on Lagunitas Little Sumpin’ Sumpin’. This has to be one of my go to beers as it’s both high in alcohol (7.5% ABV) and it boasts some of the craziest, boldest, smoothest, sweetest flavors that you can get from a wheat/IPA hybrid. Probably one of the best all around beers that you can easily find on shelves. Well Lagunitas likes to ramp it up this time of the year introducing a Belgian yeast from Westmalle Trappist (yes, that Westmalle) that not only ramps up the already bold flavors, but also the alcohol content bringing it up to a rockin’ 8.8% ABV. This beer is like drinking Christmas in the Summer. It starts with some very sweet brown sugar and spice and then finishes with a tart citrus, hop, and caramel. This beer is not only refreshing as hell, but it, while bold in flavor remains incredibly smooth. If it was a bit milder it could easily be an all day session beer. As stated before, while the La Barba didn’t pack a whole ton of different flavors, it did capitalize on what flavors it did have. The caramel, spice, sweet tobacco, and cedar married up perfectly with the existing caramel and spice in the beer as well as added a little depth by piling on the citrus and hoppiness. This was such a great pairing and the awesome mild mid-90’s, sunny weather I enjoyed it in only added to the experience. Tony, I hope things are settling down for you now. May your dad rest in peace. This sounds like one I’ll have to keep my eyes open for. Nothing larger than 52rg – yay! I’m a big fan of the regular Sumpin’, so will have to pick up on the Wild. Thank Jeff. Yeah the Sumpin Sumpin is always good in my book. I’m torn between which one I actually enjoy more. Tony, my condolence to you and your family. I’m so sorry for your loss Tony. Stay strong. It looks like a good solid smoke Tony. If you can draw a comparison Illusione cigars that’s a pretty big compliment I’d say. I’ll pick some up the next time I’m state side.